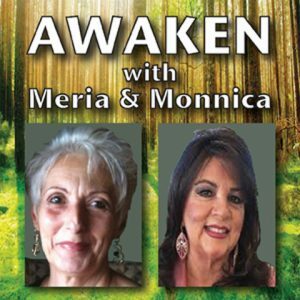 9/18/18 Awaken With Meria and Monnica. Is it a spiritual awakening or are you going crazy? Learn the difference.How to discern your intuition; how to trust; gut feelings don’t lie; be kind, not nice; left brain to right brain; run the day or let the day run you; rate your life; self talk; what is love; veil thinning between dimensions; karma and life; everyone has their own journey;John Bradshaw’s work;Ray Moody; words matter; words to lose; detachment and much more. 2 Responses to "Awaken With Meria & Monnica"
There’s just so much great information in these shows. It’s uncanny how you manage to address every issue I am going through with insight you don’t hear anywhere else. I have to pause the recording several times so I can quietly take in all the information. Genius.